This versatile piece can be worn a number of ways: a traditional headband, a hippie headband, a sash, a scarflette, a hair tie–the possibilities are endless. Plus, the simple repetitive pattern allows you to make it as long or as short as you wish. Rows 3-70: repeat row 2, finish off and weave in ends. Enjoy your sash! Make it as short or as long as you want by making less or more rows. 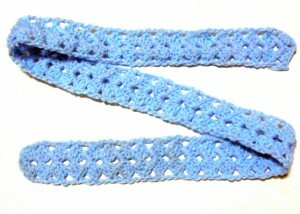 Use crochet thread to make it into gorgeous yet easy trim for anything at all. Make it shorter and use them as straps for garments or bags–the possibilities truly are endless with this easy pattern! If you need any help, just leave a comment below and I’ll get back to you when I can. Happy crocheting! This entry was posted on Wednesday, July 27th, 2011 at 12:05 PM by Claire Ortega-Reyes	and is filed under Free Crochet Patterns. You can follow any responses to this entry through the RSS 2.0 feed. You can leave a response, or trackback from your own site. For the Row 1 – is it dc in the first chain next to the hook or the first chain made? Is the ch sp (chain space) the area under the chain? Thanks so much! I can’t wait to get one finished! I need a new head band too! That would make a nice headband, or belt. Yvonne, it has to be the first chain from the hook. Otherwise, it would make a ring, instead of a long piece. Have fun! I really, really like your posts. I enjoy them too much. Thank you for being generous with your creations. I saw this belt a while ago when I was sick. I could not find it after so I’m super happy that you inclosed all the directions to make it. Thank you so much. I’m learning so much from these web sites. If I do that I get al lot of dc, but no spaces.. Can you please help me? The 2 dc and 1 shell that is after the colon is the stitch count for the row. It tells you what you should have made already so you can double check your work. You don’t need to do it again. Hi was just wondering what kind of yarn or thread you used for this pattern? I love the colors especially the pink variegated one thanks! I like the shelly sash but I am not able to follow. Can you help me please. Do I have to make chains first and then work the pattern or start with the pattern directly. The 2nd row am not able to follow. Hi Lia! You will start with row 1. No need to make a chain before row 1, just the ch 4 that starts at the beginning of row 1. On row 2, you will ch 3, then turn, then make a shell in the chain-2 space that was created on row 1, then dc in the last dc. When you are done the row you will have a total of 2 dc and 1 shell. The shell instructions are listed above the pattern as (3 dc, ch 2, 3 dc) in one stitch or ch-space. Second row make 3 chains and then turn and make a shell in second space from beginning or from 3 chain turn? Then 2 DC in the two spaces left. Then 3rd row how to do.